DS 9808 - Versatility with functionality! Achieve a new level of productivity and throughput at the checkout stand with the DS9808. 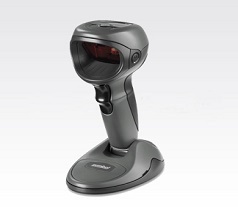 Designed to deliver a new level of versatility, functionality and performance, the DS9808 features a one-of-a-kind hybrid form factor that provides superior comfort and ease of use in both handheld and hands-free scanning modes. Inside, it offers the latest scanning technology, delivering record swipe speeds for 1D and 2D bar codes, as well as the ability to capture images and signatures, and read bar codes on mobile phone displays.